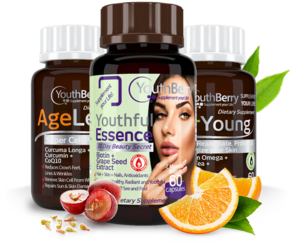 If you don’t have an adequate dose of good fats in your diet, supplement your diet with YouthBerry’s Skin Food and you’ll see a difference in your skin!These clinically proven soft gel supplements are loaded with Active Vitamin E that will help you regain your skin’s elasticity. Now look younger like never before. Vitamin E eases dryness and bolsters skin's UV defense. It is a fat-soluble antioxidant that is essential for the maintenance of healthy skin. 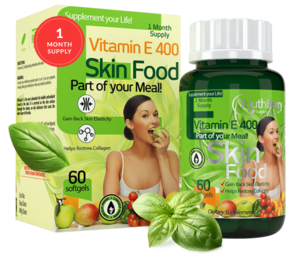 Topical application can also supply the skin with vitamin E and will provide specific vitamin E forms that are not available from the diet. 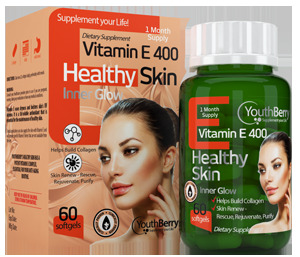 YouthBerry’s Healthy Skin has a potent Vitamin E complex, essential for your anti-aging routine.